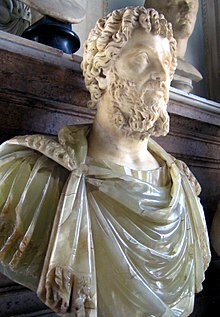 Septimius Severus (Laitin: Lucius Septimius Severus Augustus; 11 Aprile 145 – 4 Februar 211), an aa kent as Severus, wis Roman Emperor frae 193 tae 211. Severus wis born in Leptis Magna in the province o Africae. As a young man he advanced through the cursus honorum—the customary succession o offices—unner the reigns o Marcus Aurelius an Commodus. Severus seized pouer efter the daith o Emperor Pertinax in 193 during the Year o the Five Emperors. ↑ In Clessical Laitin, Severus' name would be inscribed as LVCIVS SEPTIMIVS SEVERVS AVGVSTVS. ↑ Birley (1999), p. 113.